Mix the turkey, 2 tablespoons marinara sauce, garlic, cheese, oregano, thyme, salt, pepper, and red pepper flakes together in a large bowl. Heat the oil in a large nonstick skillet over medium high heat and add the patties. Cook for 4 to 5 minutes, then flip and cook for another 4 to 5 minutes until cooked to 165*F.
During the last minute of cooking, add 2 tablespoons shredded cheese on top of each burger and cover the skillet to melt the cheese. To serve, place the patties on toasted hamburger buns. 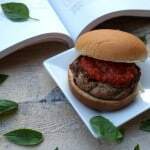 Top each patty with 1 tablespoon marinara sauce and a few basil leaves. Add the bun top and serve! I received a copy of The Natural Pregnancy Cookbook as a friend of the Foodie Physician. I was not asked to write a review, and all opinions expressed are my own.